(Lot of 8) Different Bulk Reagent On-Board Containers from Ventana Discovery XT . New Life Scientific, Inc. 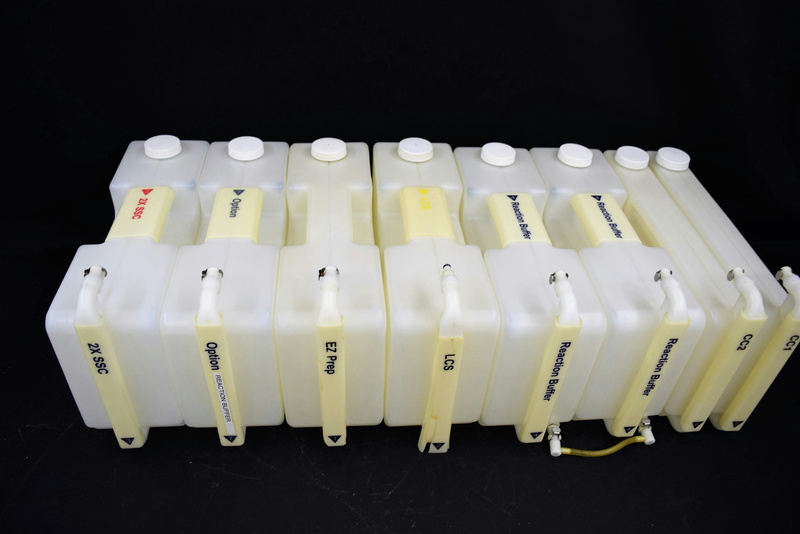 These reagent containers were removed from a Ventana 750-701 Discovery XT Automated Slide Stainer. They have normal wear or use on them, there is some minimal yellowing and the other handle jackets have some cracking, but the containers themselves are crack free. As you can see from the pictures and all the containers come with their screw caps. Picture of machine is shown for reference purposes only. There are eight Reagent Containers various sizes with screw caps. The reagent containers were confirmed by NLS staff to have normal wear and are in good condition.